Tea comes from an evergreen shrub called Camellia sinensis. It grows in eastern Asia and has beautifully shaped, glossy leaves and fragrant, nodding, cup-shaped white flowers. The leaves of this fragrant evergreen are harvested during various stages of growth, thereby producing white, green, or black teas. Each comes from the same plant, but are processed by different methods. When brewed, tea leaves create an aromatic and slightly bitter beverage. Tea leaves grown in different regions will have differences in flavor and aroma. It always amazes me that such a wide variety of tea choices can come from one simple little leaf. During National Hot Tea month, I encourage you to expand your tea horizons and try a new kind of aromatic and tasty tea. What will be in your cup today? 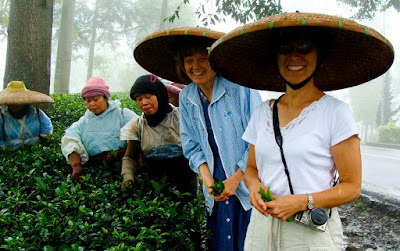 Photo: My sister, Judy, and a friend visiting with tea ladies in Indonesia. Your sisters photos are quite enjoyable! They are so beautiful to see. Thanks for sharing. I'm enjoying Lucky Dragon Hyson Green Tea in my cup. The tea leaves can be resteeped three times! In these economic hard times, I feel like I'm getting my monies worth with this one. Very sweet photo...I didn't know this either. I'm getting quite the tea education here today. My tea selections are mainly from what's available right in the house these days, but I promise to try something that I've not tried lately...got to use it up. The photos have been very enjoyable. I believe I will stick with Earl Grey tonight. I am really enjoying Hot Tea Month!